The M1 was born out of a plan announced by the Northern Ireland government in 1946 to improve the deteriorating traffic problems in Belfast by constructing a set of three "approach roads" to speed motorists from the areas around the city into the centre. The South Approach was planned to run parallel to the Lisburn Road. The chosen route began at Donegall Road and would run south-west bypassing Dunmurry and Lisburn and then heading west via Waringstown to terminate between Portadown and Lurgan. No work took place on the road in the cash-strapped post-war years, but the plan was still alive and in 1956 was updated. 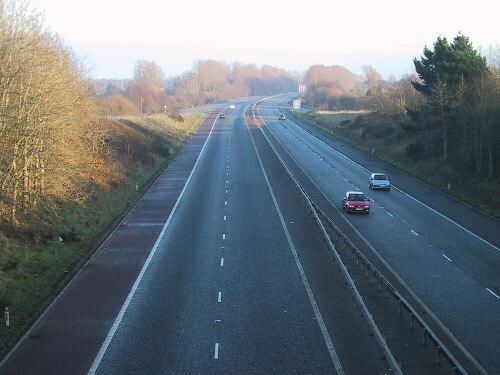 It was decided to build the road to motorway standard, numbered the M1, with a dual-carriageway from the end of the M1 at Lurgan to Dungannon. The route was thus altered to take the road to the north of Lurgan rather than via Waringstown, and this later helped in the construction of the new city of Craigavon between Lurgan and Portadown. In 1958 the government announced that the section from Lurgan to Dungannon would be built to motorway standard as well. Work began in 1959 on the Belfast to Lisburn section and the following year on the challenging section from j12 to j14 which crossed a deep peat bog. The road opened in stages from 1962 to 1968. Due to cancellations as a result of the "Troubles", the M1 was the only motorway in Northern Ireland to be completed as originally planned. A plan to connect the M1 at Belfast to an orbital inner motorway ring, announced in 1964, was scaled back in 1973 and finally scrapped in 1978. 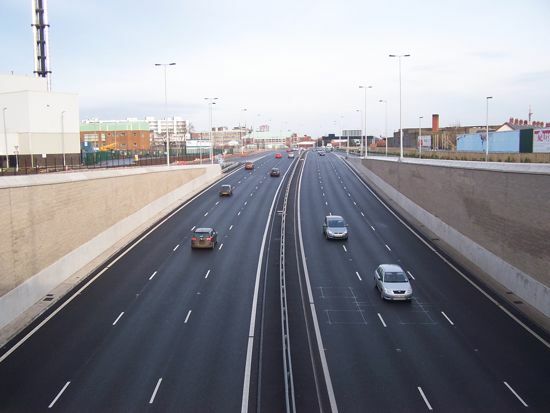 It was replaced with the A12 Westlink dual-carriageway, linking the M1 and M2 which opened in two stages in 1981 and 1983. 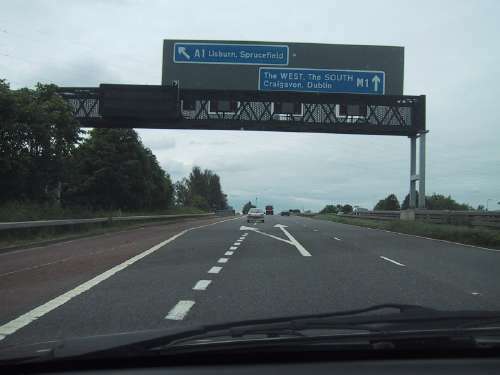 Work was carried out in the period 2006-2008 to grade-separate junction 1 so that the M1 now flows directly onto the A12 Westlink at the Belfast end. This had the side effect of lengthening the M1 by about 300 metres. Piecemeal upgrades, including the addition of two new junctions (j3 and j8) took place throughout 1980s, 1990s and 2000s. The junction 1 underpass famously flooded during heavy rain in August 2008. Compulsory variable speed limits were introduced on the M1 between junctions 1 and 3 on 16 September 2010. Roundabout is designated M12 j1, hence sliproads are part of M12. J6 (Saintfield Road) and J9 (Moira). The M1 begins in Belfast at j1 Broadway which connects with the A12 Westlink and a number of key local roads serving the city centre area. This junction was originally intended as a temporary terminus for the motorway. The plan was to eventually terminate the M1 on the Belfast Urban Motorway close to Roden Street and a new junction would be added at the Bog Meadows, about 500m south of the Broadway junction. Neither of these were built and the temporary terminus was replaced by a new freeflow underpass which opened in July 2008. The M1 is 3 lanes from here to j2, Stockman's Lane. This stretch is built alongside the Bog Meadows nature reserve which is a very important bird habitat. It also features the much trumpeted M1 bus lane for citybound buses. 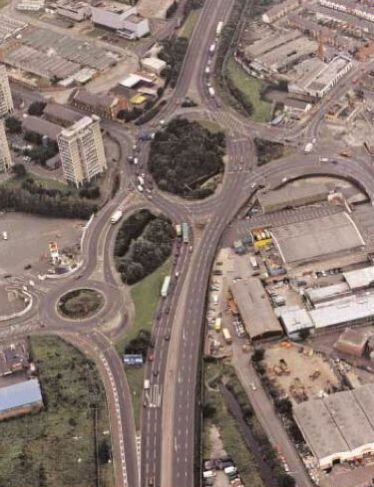 The M1 continueswith three lanes each way as far as j3, Black's Road a limited access junction with east-facing sliproads added in 1988 to serve the burgeoning Belfast suburbs of Twinbrook and Dunmurry. There is a plan to construct west-facing sliproads at j3 within the next ten years. Currently, there is a lane drop/gain here and the remainder of the M1 is two lanes each way. As we leave Belfast, the M1 crosses the River Lagan and enters County Down and a relatively long 4 mile stretch runs through picturesque countryside past Ballyskeagh and on to Lisburn. 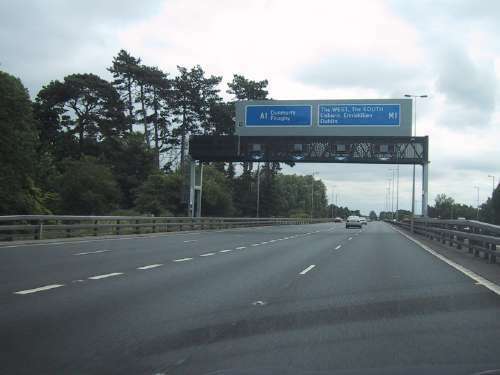 The M1 bus lane was extended as far as Ballyskeagh (half way between j3 and j6) in 2006. There are no junctions 4 and 5. These were omitted for since-cancelled schemes, including the proposed M11 round north Lisburn and the M8 to east Belfast. We next come to Lisburn, granted city status in 2000, which now sports three junctions in the space of 2.2 miles. J6, Saintfield Road, serves eastern Lisburn and is also where much traffic bound for east Belfast turns off to go along the B23 Hillhall Road. 2km further along we come to the j7 Sprucefield interchange, originally a simple trumpet interchange with one roundabout. It connects the M1 to the A1 route to Dublin, arguably the most important route on the island of Ireland. A second roundabout was added when the massive Sprucefield Shopping Centre was built in the 1980s. The west facing movements were closed in 2003 when j8 Blaris was built just 800 metres to the west. This junction was built by the private developer of the Sprucefield Retail Park and connects the M1 to the A1 via the new 1km A101 dual-carriageway. Road signs encourage A1 traffic to use junction 8, but in practice most still use junction 7. 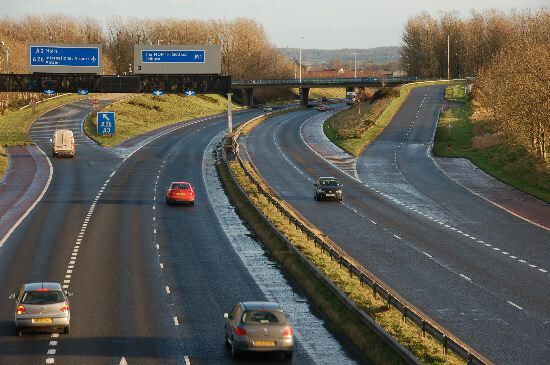 The new M1 park-and-ride is accessed off junction 8, and a major new road connecting it to Knockmore in west Lisburn is also proposed. The number 8 was originally reserved for the M11 which would have gone round Lisburn to the north and re-crossed the M1 here before continuing to Newry. The M11 plan is now abandoned. After this we come to the longest single section of the M1 which runs for 10km from Lisburn to Moira. The road takes a somewhat meandering, indirect path because it follows the route of the former Lagan Navigation. This decision was made to save money, since the canal route was already government property, although given the amount of wildlife that we now know lives on old canal routes, this is hardly a decision that would be taken today. J9, Moira not only serves the town but also the A26 north which is a main route for north-south traffic avoiding Belfast and the route to the International Airport. Many commuters living in eastern Lurgan also come off here. Just before j9, the route re-crosses the Lagan. This part of the M1, still in the Lagan Valley, is very susceptible to fog. The route from here to Lurgan takes the M1 over a gentle summit (70 metres) and down into the Lough Neagh basin and County Armagh. J10, Lurgan, caused the relatively unimportant B76 Lough Road, leading to Kinnegoe harbour on Lough Neagh, to become the primary access to Lurgan virtually overnight. It was re-designated the A76 to avoid too much confusion. The original M1 planners had wanted a single junction to serve both Lurgan and Portadown, but they relented to pressure and so now there are two. Hence after a short straight stretch, we meet J11, Ballynacor where the M12 to Portadown connects. Originally intended to be a major urban motorway serving Craigavon new city, the M12 was never completed. The west-facing sliproads were only built in 1991, 24 years after the junction opened. We now go along a flat, straight stretch 8.4km long over the wide River Bann flood plain. This section was the last part of the M1 to open, in January 1968, meaning that the M1 was split in two for a period (see construction timeline). J12, The Birches is a rural junction serving the hinterland near Maghery but is also the turnoff to Portadown for those coming from the west. The next stretch was one of the most difficult, lengthy and costly parts of the M1 as it was constructed across a peat bog which was 12 metres (40 feet) deep in places. This was achieved by blasting and infilling the bog and placing the debris along the side of the road. The path was dictated by the bog so the M1 follows a series of shallow S-bends on this stretch. It was one of the first sections begun, in 1960, but took four years to complete. Nevertheless, the J12-J13 section was completely isolated from the rest of the M1 between 1964 and 1967 when the adjacent J13-J15 section opened. 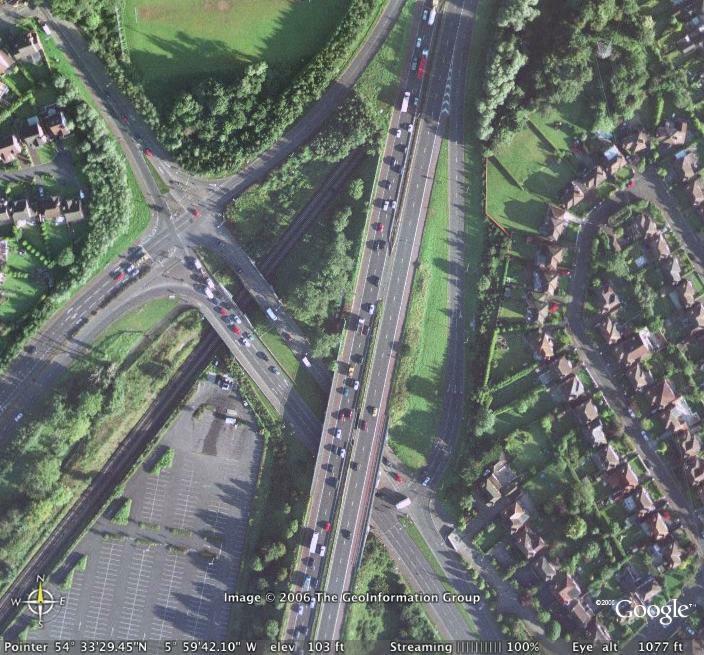 J13, Verner's Corner, is probably one of the least-used junctions on the M1, serving an almost entirely rural area. It is so close to J14 that it was probably only built to serve as an access point when this section of the M1 was isolated. 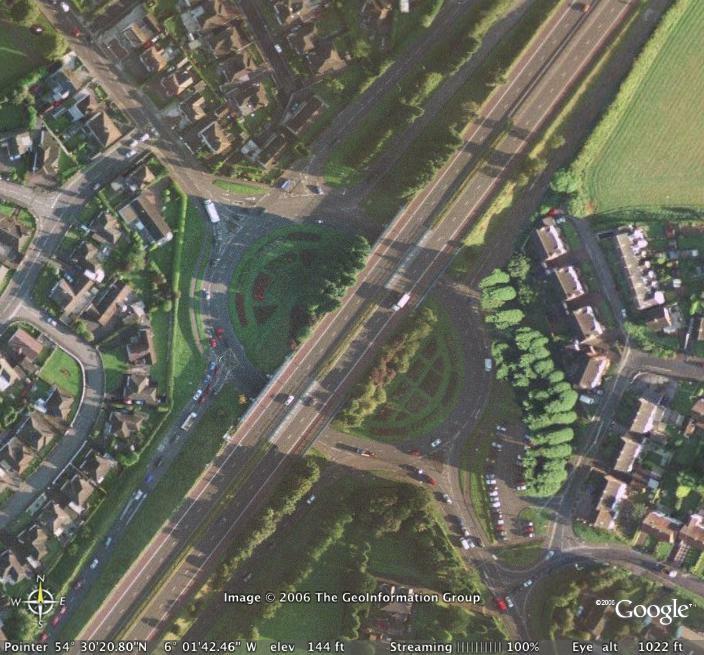 The junction is built as a partial cloverleaf, rather than the much more common roundabout. The short stretch to j14 takes the M1 round an extremely tight curve (with a radius of about 800 metres), seemingly to avoid a river, before crossing the much wider River Blackwater and into County Tyrone. J14 Tamnamore serves Coalisland and Moy. The route then leaves the bog and enters an area of gentle hills. It follows a less torturous route through a series of cuttings to terminate at j15 Dungannon. Between the opening of the M1 here in 1967 and the construction of the A4 Dungannon Bypass in the early 1980s the road beneath the j15 bridges lay derelict and unused. A number of plans are either proposed, or in the pipeline. See future schemes for more information. Many observers also see it likely that at some point in the future the M1 number will be re-assigned for the complete Belfast-Dublin route (currently M1 in NI, A1, M1 in RoI). This would mean giving the western end of the M1 a new number. It is also possible that the M1 number will be extended onto the new A4 upgrade due to start in late 2007 since this is being built to a high standard. Just south of J1 66604 2006. FOI request to Roads Service. Above J2 56562 2006. FOI request to Roads Service. J3-J6 52114 2006. FOI request to Roads Service. J7-J9 33410 2004. Parliamentary written answer recorded in Hansard. J10-J11 33559 2006. Craigavon Council Updating and Screening Assessment 2006. J14-J15 18250 2004. Parliamentary written answer recorded in Hansard. There is a persistent but false urban legend stating that sections of the M1 motorway (between j9-10 and j11-12) were built straight so as to be used as emergency runways during possible conflicts with the Soviet Union during the Cold War. This is just a story and has no basis in reality. There are other motorways, such as the M8 in Glasgow, which incorporate former airfields, but not the M1. runway (see this map for a close-up). In any case, the motorway here has a series of overbridges that would make it impossible to use the road as a runway for all but the tiniest of aircraft. Similarly, the section from Craigavon j11 to The Birches j12 is very straight (see this map) but again suffers from a series of overbridges. The road is straight here because it was built across exceptionally low and flat land and did not need any curves. In any case, the original work on the M1 featured an earthen central reservation over a metre tall that would have prevented aircraft landing on it.